I am calling on Steve Skojec, Michael Voris, Frank Walker, Louie Verrecchio, Ann Barnhardt, Michael Matt and Hilary Jane Margaret White provided she behaves, and any other bloggers to meet in Toronto in February for a Blog Conference and to bury these hatchets. Good idea. Maybe also invite Ann Barnhardt, Hilary White and Michel Matt. That is an awesome idea! If you all work together, you will be a force to be reckoned with! Or a live video link up, if travel was difficult. A very good suggestion, Vox. All of those bloggers and more (Dr.Taylor Marshall, Timothy Gordon) have far too much in common to allow disagreement to forment therein. You all oppose this "papacy" and it's Hireling. That should be enough to unite you in this spiritual war. The time for words has passed. The time for action has arrived. There needs to be far more solidarity generally among Catholics against the attacks from within and without the church. The biggest battles will be with those within the church who fail to recognise the disaster which is this "papacy"
We need to remove the Hireling from the Vatican. Individual catholics need to do what is necessary to remove the Hireling and his episcopal stooges from our church. I'd like to know what I can do as an individual to help remove the Hireling. Mortify the passions as a taste of purgatory (here so you won't have to "there"). Great idea Vox. God will take care of His Church. He asks of us to take care of the painful practical details in our personal spheres of life. should be the expanded battle cry. already.Voris seems to be ignoring everyone and Ann's money is tight. Even if it doesn't happen it was a good thought. Save the liturgy, save the Religious Orders, save the world". Yes. *Should* be the battle cry. Prayer in liturgy. Prayer in hidden Religious Orders. Prayer in reviving orthodox faithful Catholics in every obscure corner of the globe. That should indeed be the focus; the "battle cry". May our current divided, selfish sickness be replaced by this spiritual health. If meeting in person is too hard, then certainly it can be had via an online video conference. Or those who can't attend skyping in. Time to open up our own windows about what to do about Jorge. I do not think that a 'conference of bloggers' is helpful at all. People are solidified in their opinions and what is needed is the grace of God to remain prudent and charitable while sharing, writing and dealing with the natural opposition of people who think differently from you. Also, coming together for a conference smacks of arrogating exaggerated importance of the bloggers' role. Bloggers are no more knowledgeable than those who do not blog; for thinking people they do not 'lead' but rather can offer insights which persons can either take or leave. One sees certain bloggers exhibiting inappropriate and self-important attitudes, as well as loose, flippant chatter on social media all the time. Why would you formalize this self importance with a 'conference' as if these people were heads of state? What many of these bloggers need is honest reflection before the Eucharistic Christ who truly leads by His humble silence and hiddenness. In this way they would be more sensitive to speaking as He would have them speak. This comes form His grace and Wisdom, not from more talking and debating. Brilliant comment Barbara! We laity must remember that we are not the Teachers, we are the Taught. The current circumstances force laity to do their best to defend the Faith because there are not many Clergy to do so. This is good and a correct response, but we do not have proper theological or philosophical training. We are not Priests. 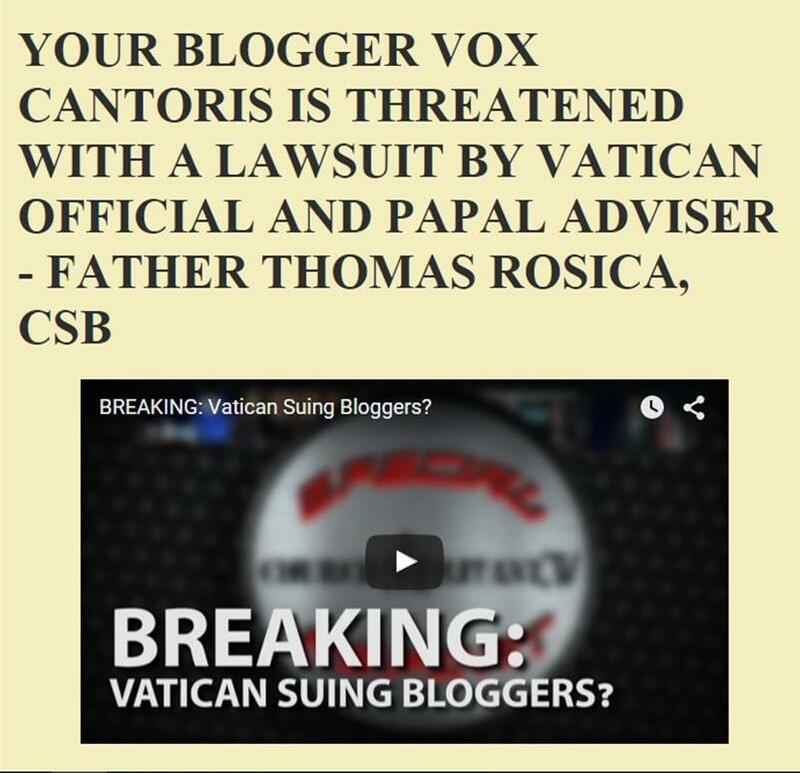 After 60 years of novus ordo, some bloggers have little knowledge of the Faith and do much harm spreading trash and even heresy around. Some do great good and defend the Faith truly. But the bottom line is that we Catholics have Holy Scripture, the Sacred Tradition and the Magisterial Teachings of the Church over nearly 2000 years readily at our disposal. The Catholic Church is indefectible and our Faith is immutable. We have the pre-roncalli/vatican II Catechisms at our disposal. These are the sources of Catholic Truth and we can consult them any time the need arises. Only a desire to get them to stop shooting at one another. Fortunately, I can’t know what went down on Facebook but I was pretty certain an angry response would ensue. I think as long as nobody is actually shooting at one another, an extremely heated debate is absolutely necessary, right now. People are going to misspeak or be wrong at times, they should be careful. I shouldn’t have said I was going to follow Pope Michael, it was probably sacreligious to speak of the Papacy in a flippant manner like that. Please accept my apologies for any scandal I may have caused. I think it’s more likely that David Bawden is Pope than Jorge but it certainly doesn’t seem like a very reasonable possibility. Evidently, there is some way to elect a Pope of the Catholic Church, so someone really needs to get on that. Someone commented on here about sedes becoming obsessed w/the Papacy. And I have to say I can relate to that. I am pretty darned upset that my children do not have a Pope, it is EXTREMELY important to me. I want them to have valid and LICIT Sacraments from Priests in union with the Pope. I’m old, I can just go out into the desert and die saying the rosary but I’m charged with the care of some souls here. This is important, so I’d like to see more people start flipping out over it. Personally, I’d look at that 1958 conclave, something seemed to change just a bit after that one, no? To me, it seems a little ridiculous to get in the way back machine and hop on back to 2013. 2013? Please, I’ve suffered through the New Order all my life, you can’t tell me that Jorge was the first guy to commandeer our Vatican lacking the protection of the Holy Ghost. It can only be desperation attaching people to this idea. It's important because the enemy tactic of divide-and-conquer is obviously at work. Your opinion about the importance of bloggers is irrelevant. The point is for the various generals to come together to put up a united front against the true enemy. This is why the liberal media has been successful for so long. This is how wars are won. Nobody has to agree with each other on everything. Just agree to work together on what you do, and where you don't, just politely disagree without it becoming a civil war amongst yourselves. Especially in areas where things are legitimately confusing. Right now these blogs and independent outlets are the only peaceful recourse that Catholics have. So they ARE IMPORTANT!!! And information warfare IS IMPORTANT !!! That's why the globalists and the modernists are VERY CONCERNED !!! They certainly recognize their importance. It's time you also did. Excellent idea. I propose Southdown Institute as the meeting site. They are all - without exception - deeply disturbed people who need spiritual and psychological counseling. If only. They are also very dangerous people, leading souls into sin, and on the way to - potentially - Hell. They are, without exception, in spirit, deeply protestant. Those who encourage them, give them a platform, are a material accessory to these evils. I encourage Catholics to pray about this, and break all social media relations with them. Do not follow them, do not encourage them. These poor, deluded souls, need prayer, not flattery and an audience. I'll admit, it would be nice to see such a Bloggers' Conference. But if it doesn't happen, it doesn't happen ... even though all concerned have their followings, who would assist with costs if that was an issue. I was even going to offer some money to help with that. Do let us know if it's in the works, though, please and thank you. Dear Melanie, I love you! :) Yes, strange things did happen at the Conclave. White smoke issued forth for 5 minutes by the clock; a Cardinal left the sealed conclave; the CIA, or FBI (I don't remember which) reported that a Pope had been elected - Gregory XVII - ie Cardinal Siri. People refer to the "Siri Thesis". Look it up. We do not know all the details of what happened. That a Pope was elected and then impeded is possible. Could a Pope nominate a successor under such circumstances ? I do not know. The bottom line is that we do not know. But, what we DO know is that roncalli and montini were registered free masons and were therefore automatically excommunicated and not eligible for election to the Papacy. We know with certainty that they were anti-popes and had zero authority to summon, or promulgate vatican II, which was therefore a false and heretical council. Therefore everything which emanates from vat II is false and invalid. Don't worry about it. Our lord is in control. In time we will have all the answers. In the meantime we have the Faith and all we have to do is to stick to it and make sure our loved ones are properly catechized in the Faith of their Fathers and kept away as far as is possible from the novus ordo "church." Initial meetings should happen in private on a one-to-one basis to come to some agreement before doing anything public together. Let us not cease praying for each other as we are all affected by the evil of the apostate and fouled world we are in as discourse has become very unholy and unCatholic. Lord, have mercy on us. All we can do is obey God, the Holy Faith and morals and reject all that is against same. Prayer and penance in atonement and supplication. Offer all one's suffering up to God for Him to use for the salvation of souls. We are all suffering terribly as a tiny remnant in a very evil world. How many of have family members that are engaged in public mortal sin in one way or another? There are very few Catholic families with the graces of remaining true to the Faith and moral law. I'll say a prayer for you now. Facebook is rotten. I never went near it. But I can see how it amongst other things has contributed to the corruption of morals among people I know - it aids people in entering into sin, and cooperating with the sin of others. But that is what it is designed to do - destroy morals and good family and social relations, and reason, and order in personal, family and community life.